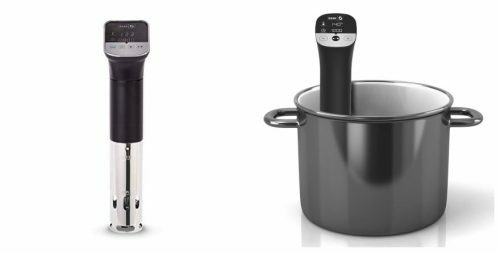 Our reviewers looked at 33 different Sous Vide models including 1 from Dash. We reviewed each model for quality, features offered, ease of use, controls, power, flow rate, and connectivity. You can compare this model to one of our top recommendations the Wancle Sous Vide SVC001 which we feel is a much better value for your money. Use the table below to compare Dash Chef Sous Vide Reviews, you can click the product at the top column to read a more detailed review. 15" 3.7" x 4" 11.1" x 14.8" x 4.5" 16" x 3.5" x 3.5"
The Dash Chef Sous Vide is an average quality sous vide cooker, that isn't competitively priced compared to other models.